I’ve logged around 1,500 hours riding the New York City subway over a period of 6 years. I live in Queens, work in Manhattan and often like to hangout in Manhattan or Brooklyn. Hence, I get around a lot on the subway. With this insight, Iâ€™ve developed a set of survival rules that you may not find written in an official guide. Your New York City friends may find them too obvious to talk about. Hence, if you’re from out of town just visiting or planning to move here, you need to read these. If you’re a New Yorker, I would love to hear your gems of wisdom, which I can add here. mta.info – This site provides the most up-to-date information on New York City Subway, LIRR & Metro North trains. You may end up suffering a lot of pain, if you don’t check the latest status of the trains for late nights and weekends from this site. You can even sign up for alerts for your individual trains. There my be changes in schedule due to construction, typically on weekends and late nights. Train time and door-to-door time are two different things. It takes time to walk to the station & most often you need to wait at the platform before a train arrives. For Example, my train ride to work is 30 minutes, but door to door, it takes 45 minutes. All transfers do not take the same time. Transferring in some stations can take up to 5 minutes. Yes, I’m looking at you: Time Square station & Penn Station. Frequency of trains is not the same throughout the day. Expect to wait longer during non-rush hours and even longer after around 10:30 PM. If punctuality is important, leave early, trains get delayed and stuck all the time. It’s not even funny how often that happens. HopStop.com actually incorporates all these issues when preparing an estimate of travel time for you. Coming for an Interview – Plan to arrive at your interview 30 minutes before, if not more. If nothing happens, you’ll get there 30 minutes early, find a Starbucks(its almost guaranteed that there will be a Starbucks in a 5 block radius from your interview building), relax for 20 minutes and get to the interview 10 minutes early. If something does happen, you have an extra 30 minutes to assimilate the delay or have enough time to get out and quickly catch a cab. This happened to me when I was going to a Google interview in Chelsea and I’m glad I left early. It was raining hard, subways stopped working and I had to jump out and look for a cab. I wouldn’t have made it on time if I didn’t leave early. There is an app & picture for that – You donâ€™t necessarily need a fancy app on your smartphone, even though several are available. 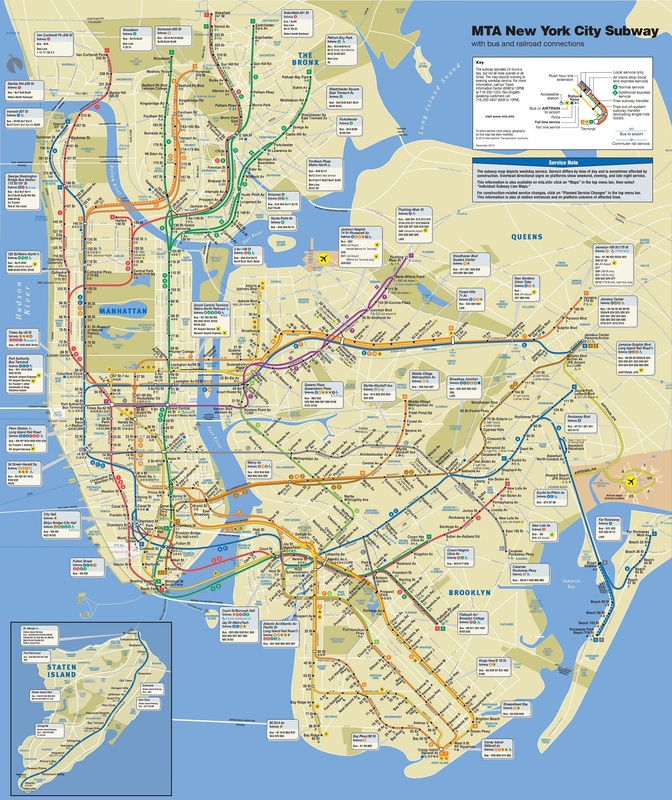 Save the subway map image in your phone’s picture gallery and just look at that when you have no data connection in the train or on the platform. Quite a few stations now do have Internet coverage, but its not ubiquitous and there is definitely no connection in the tunnels. Metrocard, Unlimited vs. Pay-As-Yo-Go – According to my calculations, you will need an unlimited Metrocard if you’ll be making 2 or more trips each day. Otherwise a pay-as-you-go is better. At the time of writing, there is unlimited only for 1 day, 2 weeks or 4 weeks. Going crosstown – The whole system is better suited for traveling in generally the North/South direction. For cross-town traveling, it might actually be better to walk or take a cross-town bus. It’s also not well designed to go from one non-Manhattan borough to another non-Manhattan borough. Consider a bus or a taxi. Transferring by foot – Willing to walk a few blocks between stations can save you a long transfer. HopStop.com can help you with that. They have an option where you can specify that you would like to walk more and transfer less. However, this is only advise if you have an unlimited Metro Card because it would cost you two rides for a trip involving one transfer by foot. In my experience, the first, last & the middle cars are the most crowded. Most of the times, the stairs that come down to the platform from the street level are at these locations. Most people simply climb down and wait in the area near the stairs. I suggest walking away from the stairs for a bit before finding a spot to wait for the train. For stability, ride the subway sideway, like a skateboard. Most of the jerks from the moving train are front to back. There are almost no sideways jerks, or at least none that can throw you to the ground. Standing sideway in-front of closed doors is the most stable, one can stand there without holding anything. Do watch out when the doors open, you’ll be in people’s way for a bit. If you really need a seat, you best bet is to stand sideways in front of sitting passengers. There is always a pole right in-front of the doors and people have a natural tendency to grab it. Remember to go in and stand in front of the sitting passengers & pray that the one in front of you gets off soon. You’ll be too far to catch a seat if you keep on standing at that pole. Subways cars are not ventilated uniformly. A typical subway car has 4 doors. I would advice entering through either of the center 2 doors, not the outer two doors. If a subway car is completely empty during rush hours, donâ€™t get excited, be weary, there will certainly be something wrong. Either the A/C is not working or there is a bum in the corner stinking up the whole car. The Red, Green & Purple line trains are thinner than the rest. Depending on the situation, local trains may not take that much longer than an express one and you will find a place to sit!